With a gruelling three races within three hours, they beat off the challenge from Italy for the bronze medal at Gwang Myeong Velodrome. The juniors world championship followed the Olympic format with qualifying, semifinals and finals, but run over the same day. The Kiwi quartet of Regan Gough, Nick Kergozou, Luke Mudgway and Jack Ford qualified second fastest in 4:10.873 before being pipped by Australia who went 0.8sec faster. The Kiwis then took on Colombia in the semifinals, edged out of a shot for gold by 15/100ths of a second to relegate them to the bronze medal match up. The New Zealanders clocked a solid 4:11.453 to claim the bronze medal in convincing fashion, after a tough day. "We’ve come here with just four riders so it was a big ask for them to race three times in such a short space of time," said head coach Ross Machejefski. "They had one ride in 4:10 and two 4:11s, so they lasted really well. "They caught Colombia who had a fantastic ride. We were up for most of it but an error with one change put us behind. We fought back but were pipped. "That said I am pleased with their performances today on what is a tough track." 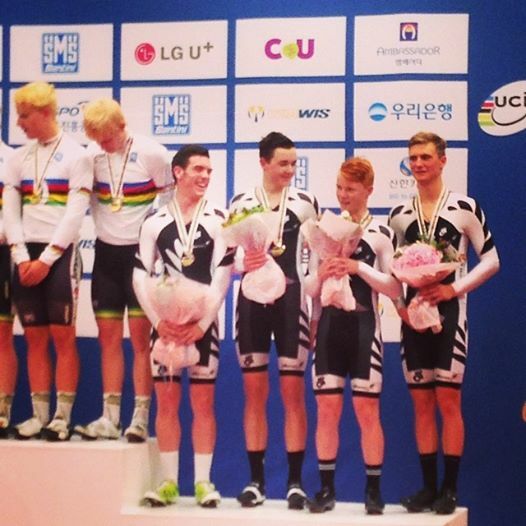 It is the fourth straight year that New Zealand has won a medal in the team pursuit. The velodrome is designed specifically for keirin racing, with a concrete surface and shallow banking. "It’s quite slow and has taken some adjustment. For instance the Russians went 4:09 on the boards at the European championships in the team pursuit but went 4:15 here." Earlier the women’s team sprint combination of Olivia Podmore and Katie Stewart were seven fastest in the team sprint in 47.281 a won by Germany, while Russia won the men’s sprint with the Kiwi trio of Lewis Eccles, Michael culling and Jordan Castle eighth in 1:03.435. Endurance rider Regan Gough will have little chance to recover, back on the track for the individual pursuit tomorrow. "It is tough on Regan for sure but I am sure he will bounce back well."